Is That A Lion Riding In The Cab Of A Chevy Silverado? 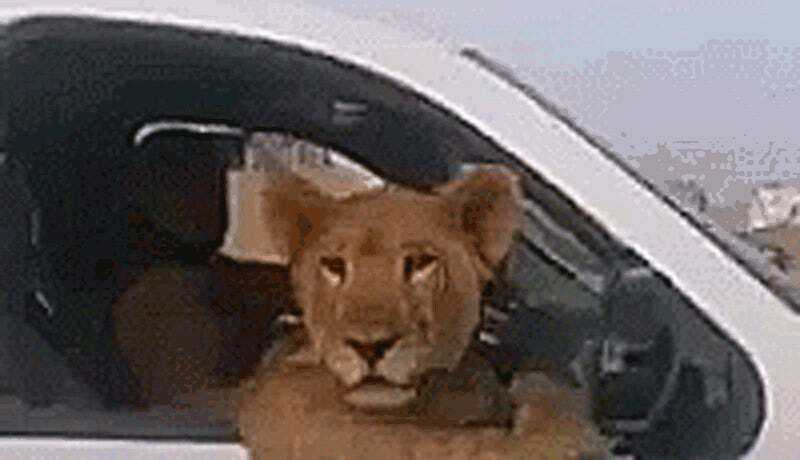 Someone spotted what definitely looks like a real lion casually riding in the cab of a late-model GM work truck. Dubai, huh? I guess if you don’t want the requisite exotic car, you can roll with a wacky pet. But I’d rather imagine this is just one of the zoo’s work rigs and the lion conned a zookeeper into taking her on some errands. Or even better; the “person” driving is another animal in a human costume and these two troublesome creatures are on their way to live and/or pitch a Pixar movie! Once you’re done processing the ridiculousness sharing a small, rolling enclosure with a large carnivorous predator it’s also kind of funny to think about how dog-like this big cat is behaving. Catch that sweet sandy breeze, baby.